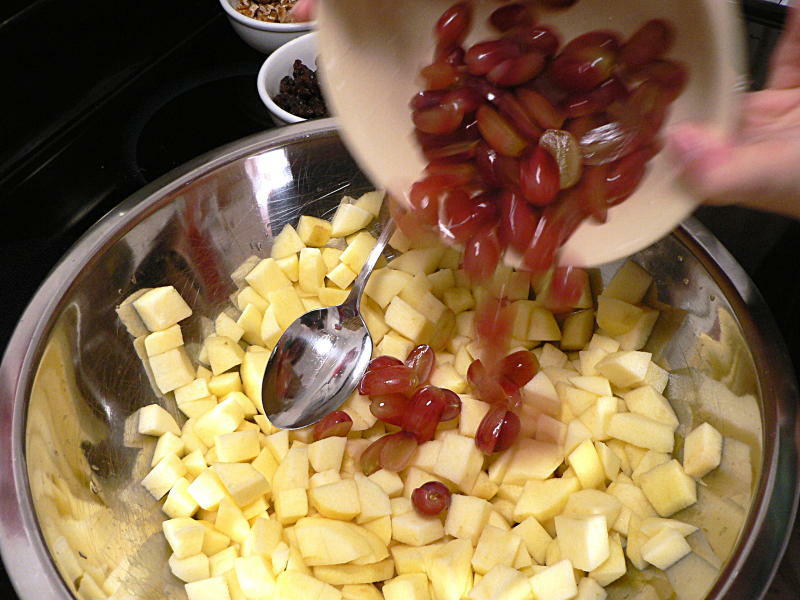 Created at New York’s Waldorf-Astoria Hotel in 1896 not by a chef but by the maître d’hôtel, (dining room manager) Oscar Tschirky, the Waldorf salad was an instant success. 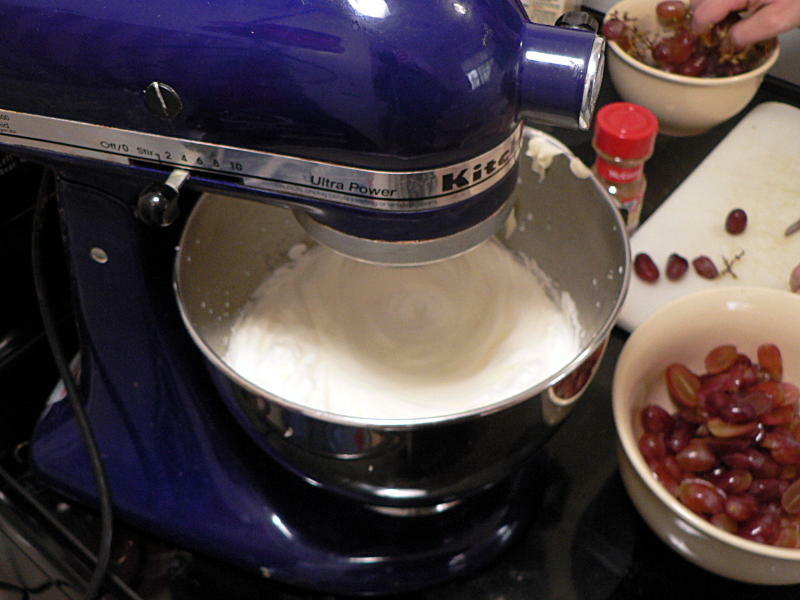 So it turns out the one I grew up on was pretty close to the “classic” version. Who would have guessed? 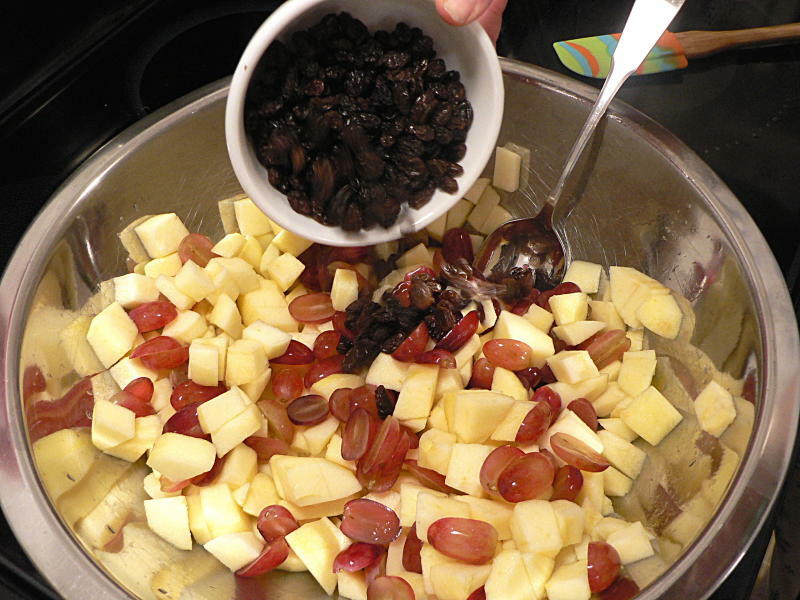 Don’t get too hung up on precise amounts for this salad. 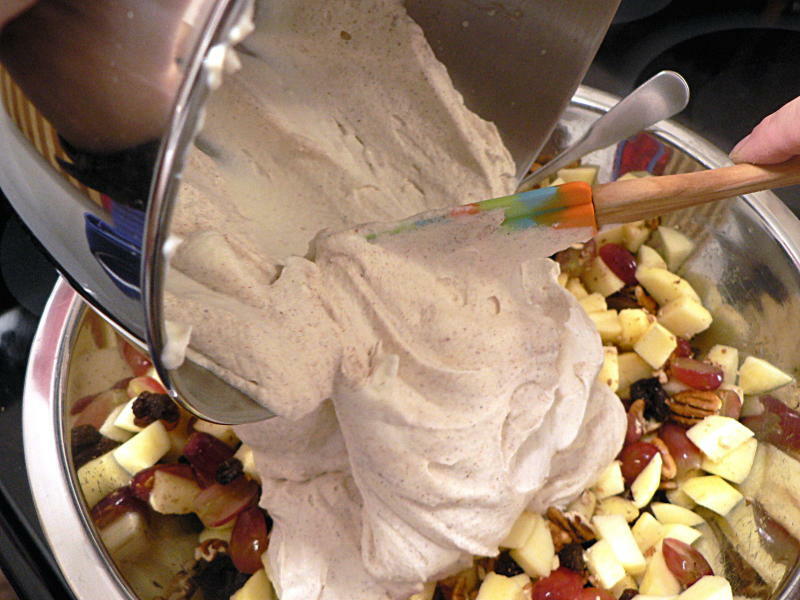 As long as it’s mostly apples, the ratio of mayo to cream is pretty close, and you like all the other ingredients, it’s probably going to be pretty good. 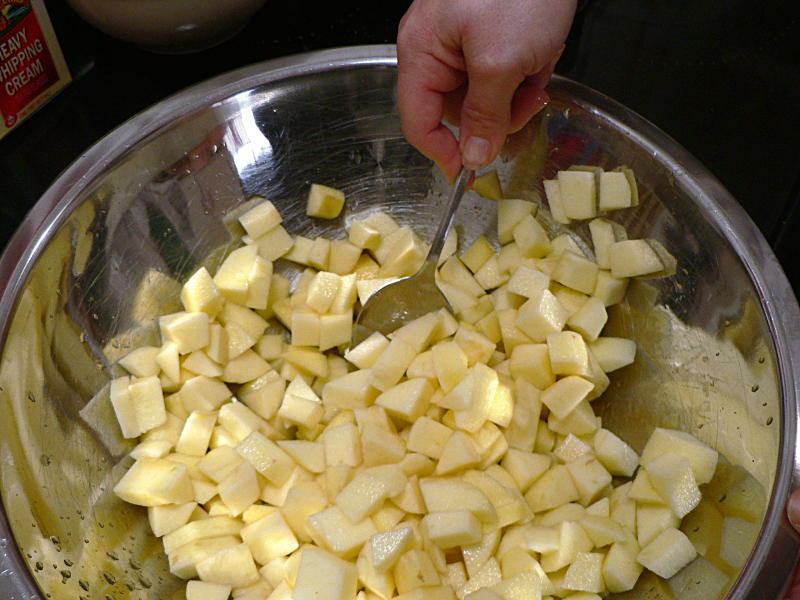 Start by peeling and dicing the apples. 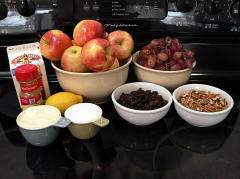 (Same process as when making the applesauce.) But since this isn’t going to be cooked, you don’t want it turning brown. 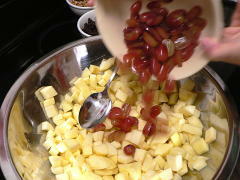 To preserve the color after you dice them, squeeze in a little lemon juice and give it a quick toss. 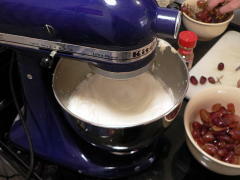 The lemon will prevent oxidation. Next up, turn the cream into whipped cream by … whipping it. 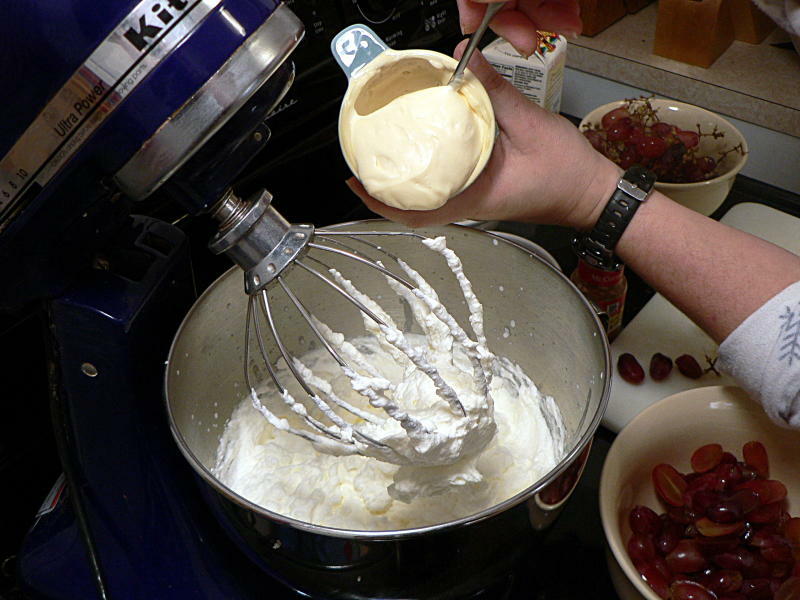 What, you thought whipped cream meant they abused the cows or something? Wierdo. 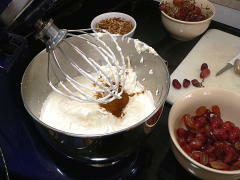 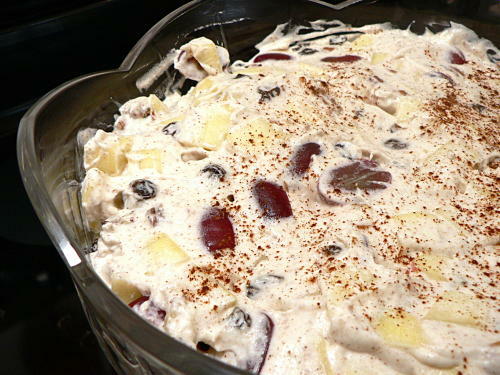 While the mixer is going on the cream, cut the grapes in half lengthwise. Add the sugar to the cream when it starts forming soft peaks. Then add the mayonnaise and beat again until just combined. Add the cinnamon and beat one last time. 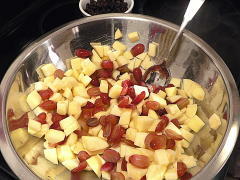 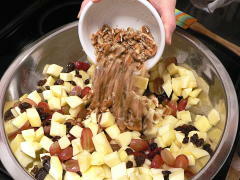 Now back in the first bowl, stir the grapes raisins and walnuts into the apples. Now add the mayo/whipped cream mixture and stir it in gently. 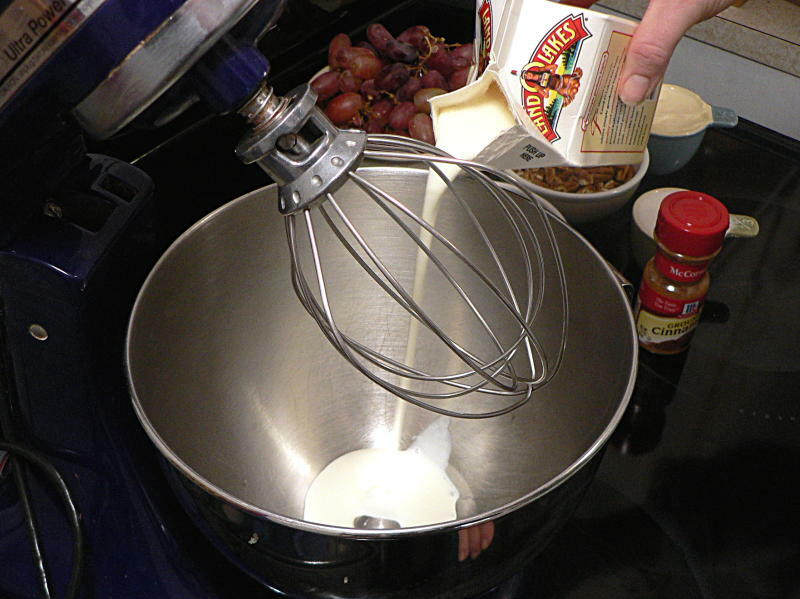 You don’t want to beat it and deflate the cream. You can serve scoops of this on a bed of lettuce, like the note up top suggests. 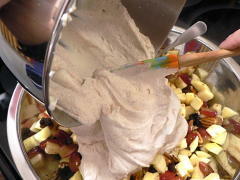 Or just put it all in a fancy bowl and sprinkle a little more cinnamon on top to make it look nice. Peel and dice the apples. 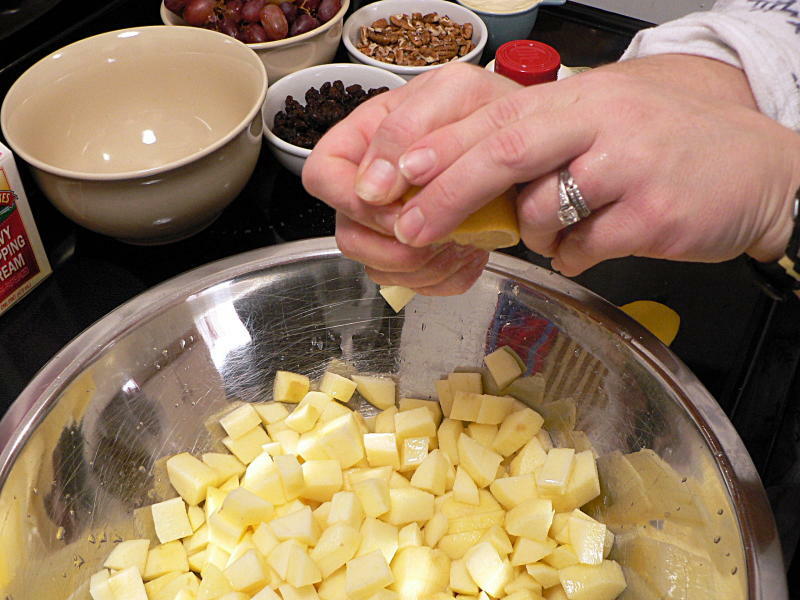 Toss with the lemon juice to prevent browning. 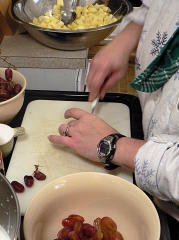 Slice the grapes in half lengthwise. Chop the walnuts. Mix all fruit and nuts together in a large bowl. 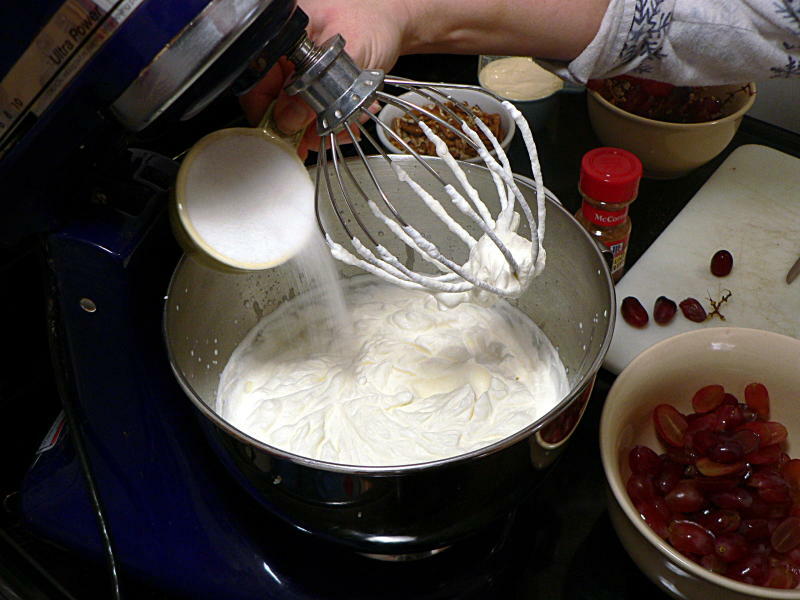 Whip the cream until it forms soft peaks. Add the sugar, cinnamon and mayonnaise and beat until just combined. 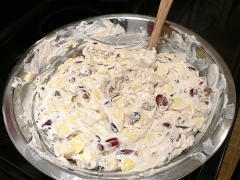 Fold the dressing in with the fruit and nuts. 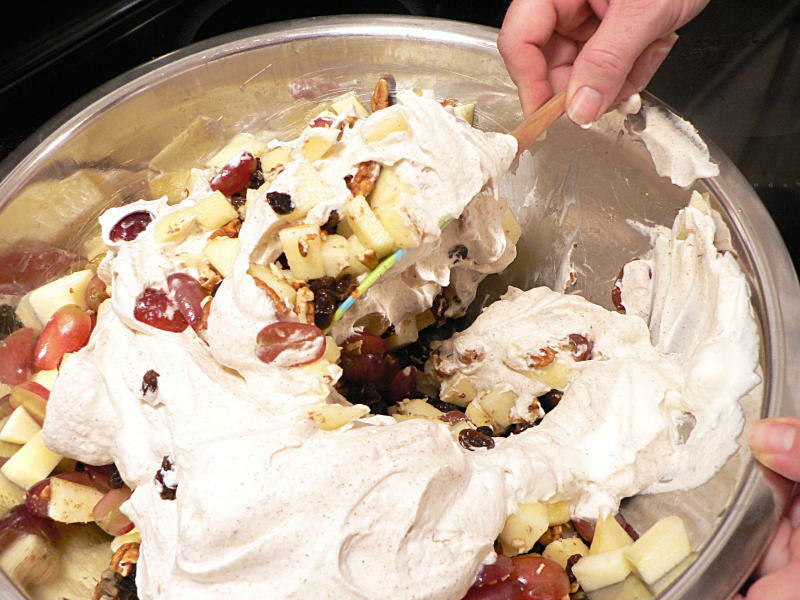 Be gentle, careful not to deflate the whipped cream. 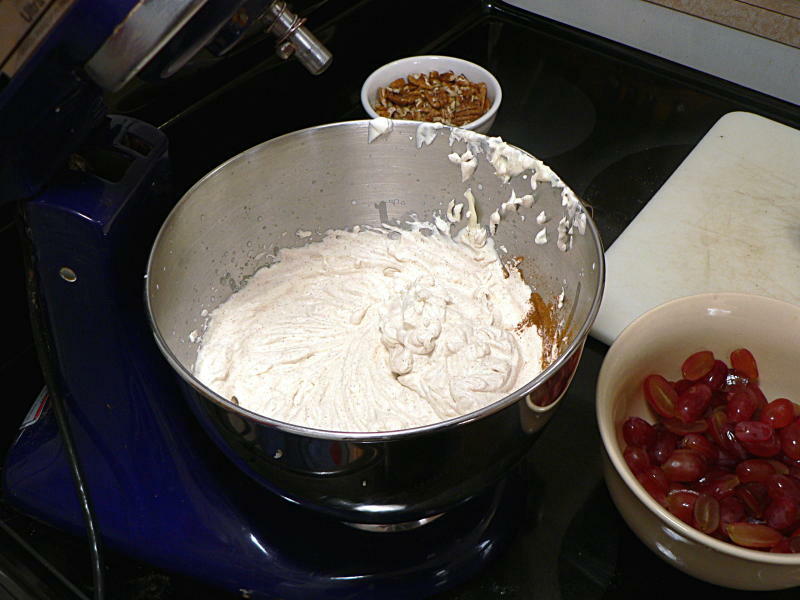 Serve individual portions on a bed of lettuce, or serve buffet-style in a decorative serving bowl.